A fine-looking natural landscape that is filled with an astounding terrain, hot springs, geysers and various other natural thermal areas that are going to amaze you with its numerous natural assets on every single step you take. That is the amazing Yellowstone National Park! It is indeed an incredible place to be – the World’s first National Park. Yellowstone National Park has its own unique history. It is known to be the world’s first national park which was given the status back in the year 1872. To add to it, the Yellowstone National Park is also a UNESCO world heritage site which certainly boasts its significance on the global map. The park itself is a great example of natural beauty and diversity. It is incredibly jeweled with the boiling mud pools, hot springs, geysers and other geothermal features along with an abundant wildlife which includes wolves, grizzly bears and freely roaming hers of elks and bison. The Yellowstone National Park has become a lively center for the tourist, as thousands of tourist visit the place every year. It is located in the western states of Wyoming, Montana and Idaho. 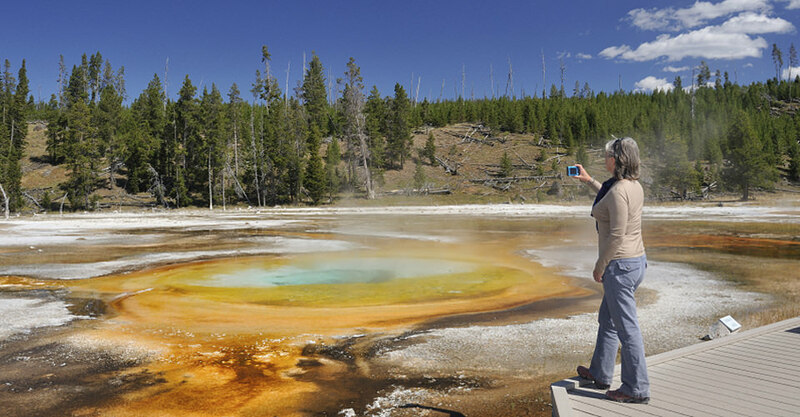 Tourists from all around the world come to witness the unique and rare geothermal activities happening in this area and moreover the countless holidaying options they get to have with the Yellowstone National Park. The National Park offers mixed feelings of adventure which allows a visitor to enjoy nature with its exclusiveness. While you are holidaying in the Yellowstone National Park, you can have several amazing options at your disposal. You can mesmerize yourself with the exclusive shows going on this terrain which you will not find anywhere else. Or you can go swimming, fishing, wildlife viewing, hiking, camping etc, with utmost closeness to nature. No matter what you choose, always remember that you are in a national park and therefore you must follow all the rules and regulations to practice maximum safety. What you can see at the Yellowstone National Park is more of a debatable issue due to the innumerable options available. You can start your program with the Mammoth, Madison and Norris, Geyser basins including the Canyon, Lake Area, Grant Village, Old Faithful and Tower-Roosevelt etc. Moreover, you can devote some time to wildlife seeing as well which is aplenty in the Yellowstone National Park. For everyone visiting the Yellowstone National Park, it is a completely different experience of being. So what are you waiting for? Pack your bags now and set out for the white sands of the Panama City and have an amazing experience of the lifetime. This entry was posted in Around the World, Trips. Bookmark the permalink.